Greens Ledge, west of Sheffield Island and a little over a mile long, is one of several treacherous formations near Norwalk Harbor. _A lighthouse to mark the ledge was first proposed in 1889 to help mariners through the west entrance to Norwalk Harbor, which was a growing commercial port. Congress appropriated $60,000 for the establishment of a light and fog signal at Greens Ledge in 1899. The 52-foot lighthouse was finished in 1902. When Greens Ledge Light became operational, the 1868 granite lighthouse on Sheffield Island was discontinued. Greens Ledge is a cast-iron tower on a cylindrical cast-iron concrete-filled foundation, typical of offshore "sparkplug" lights built in the late 1800s and early 1900s. The first keeper was William DeLuce, who stayed until 1908. The lighthouse originally had a fifth-order Fresnel lens exhibiting a flashing red light. In May 1902, just three months after it became operational, the lighthouse received a fourth-order lens showing a white light with a red flash every 15 seconds. John Kiarskon, a native of Sweden, arrived as assistant keeper in 1909 and was soon promoted to principal keeper. On March 2, 1910, Kiarskon left the lighthouse in the station's only boat, telling Assistant Keeper Leroy C. Loughborough that he was going to Norwalk to pick up provisions and both men's paychecks. He never returned. Eleven days later, the lighthouse tender Pansy landed at Green's Ledge and found Loughborough "half-starved, exhausted and almost crazy," according to an article in the Washington Post. Loughborough told authorities that during the time he was abandoned, he lived on potatoes and dog biscuits, with only boiled salt water to drink. Through the whole nightmarish ordeal, Loughborough struggled to keep the light going along with the two engines for the fog signal. For three days, he neither ate nor slept. During one 72-hour stretch, there was continuous fog, and one of the engines failed. He struggled vainly to repair the engine, and meanwhile the light burned itself out. When the tender crew arrived to investigate the extinguished light, the assistant keeper was found, almost unconscious and with his dog at his side, on the floor by the engine. Loughborough later said that he would have shared his last biscuit with the dog. It turned out that Kiarskon had gone to a local hotel, where he cashed Loughborough's paycheck for $44.69 and went on a drinking binge. He eventually gave himself up to Bridgeport police and was taken to South Norwalk. Kiarskon was immediately discharged as keeper and was expected to serve time in prison for forgery, but his ultimate fate is unclear. I would not go through that experience again for the United States mint. Several times I inverted the flag on the mast, intending to attract the attention of some passing boat and thereby escaping to the mainland, but the greater part of the time, it was so stormy or foggy the signal could not be seen. Each time I would take it down, determined to stick it out to the end. I was almost out of my head from the strain. It would not have been so bad save for the awful fog, which made me keep at the engines night and day. It is well that the Pansy came when she did. I don't think I would ever have moved from that rug. Assistant Superintendent John S. Hayward was on the Pansy when Loughborough was found. On examining the lighthouse log, Hayward saw that Kiarskon had made no entries for 11 days, supporting Loughborough's story. The assistant keeper received high praise for his heroism in the face of abandonment and possible starvation. Loughborough never recovered from the ordeal. A little less than a year later, in February 1911, he died of tuberculosis at the home of his father in Point Judith, Rhode Island. He was just 27 years old. _William T. Locke was the next keeper, and Leroy Loughborough's brother, George, became his assistant. One day in March of 1912, George Loughborough went ashore to South Norwalk. It was reported that while there, he learned of an aunt's illness and went to visit her in Wakefield, Rhode Island. After 16 days, Keeper Locke was found alone at the lighthouse, weak and exhausted. He told the authorities that he had gotten little sleep since the assistant left, and had reduced his daily rations to a minimum out of fear of starvation. Locke was luckier than Leroy Loughborough, as he apparently recovered from the episode. It isn't clear what happened to George Loughborough, but his lighthouse-keeping career was no doubt over. This story begs for more details, but few can be found. One cold day in February 1917, Assistant Keeper Frank Thompson went ashore for supplies. As he rowed back toward the lighthouse early in the afternoon his boat became trapped by ice floes. He was helpless as his boat was pulled by the tide farther out into Long Island Sound. An alert resident of South Norwalk saw the trapped boat and notified the lighthouse authorities. The Bridgeport Towing Company dispatched a tug whose crew rescued the practically frozen Thompson about 10:30 p.m.
Over the years, especially after the hurricane of September 1938, Greens Ledge Light developed a tilt, and the keepers complained that the vibrations from the station's generators caused all the furniture to move to one side of the tower. They solved the problem by only having furniture on one side. 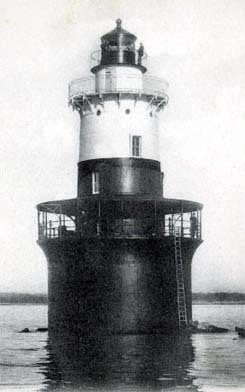 Green's Ledge Light in the 1940s. Photo by Andrew J. Simso, courtesy of Sarah DeMaria. 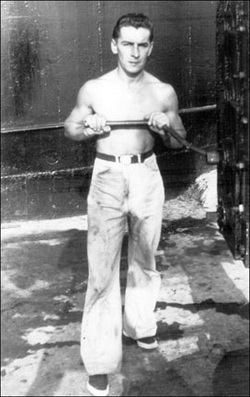 In May 2011, Sarah DeMaria provided the following story involving her grandfather, Andrew J. Simso II, who was one of the Coast Guard keepers at Green's Ledge 1943-47. He and another Coast Guardsman went ashore to get supplies in February. They docked about 6 or 7 p.m., retrieved the needed supplies and began home. In their efforts to return to the lighthouse, they attempted to follow a channel cut through the ice by another ship. Unfortunately, this was futile; the ship had passed too long prior and my grandfather and his fellow sailor became trapped as the ice surrounded their small boat, leaving them stranded. In the pitch dark the men yelled for help but no one heard. They decided to try to walk back to shore on the frozen ice, but both men fell through into the frigid waters. The men managed to pull themselves out of the water and get back to the boat. The two -- shivering and freezing wet -- continued to yelled for help. This time people ashore, hearing their calls, contacted the authorities. The two men, on the verge of hypothermia, were rescued. Left: Andrew J. Simso II, courtesy of Sarah DeMaria. The lighthouse was automated in 1972, and the Fresnel lens was replaced by a modern rotating lens. The tower has been altered a great deal; the main (lower) gallery roof and original iron railings and stanchions have been removed. Greens Ledge Light, painted brown on its lower half and white above, remains an active aid to navigation. Under the provisions of the National Historic Lighthouse Preservation Act, the lighthouse was auctioned in 2016. A high bid of $150,000 was accepted in September 2016. The high bid was placed by a group of local residents that included Tim Pettee, Alex Pettee, Brendan McGee, and Shannon Holloway. They subsequently formed a 501 (c)3 organization, the Greens Ledge Light Preservation Society, The $150,000 acquisition of the lighthouse was made through a founding donation by the Pettee family. The Greens Ledge Light Preservation Society launched a fundraising campaign in 2017. As of August 2018, the "Save The Light" campaign has raised over $1.5 million through private donations for restoration. Work on the lighthouse began in June 2018 and is scheduled to be completed by the end of 2019. It can be seen distantly from some spots on the Norwalk shore and from the public ferry to Sheffield Island. It is best viewed by private boat.